Summit County has lots to offer when it comes to Easter services. The Church at Agape Outpost offers non-denominational services, while St Mary Our Lady of Peace offers multiple days and times to attend in Silverthorne, Breckenridge, and Copper. Eggs not your thing? Spend the weekend celebrating the end of the season at Copper’s Sunsation – two days of live music, competitions, and epic spring skiing. 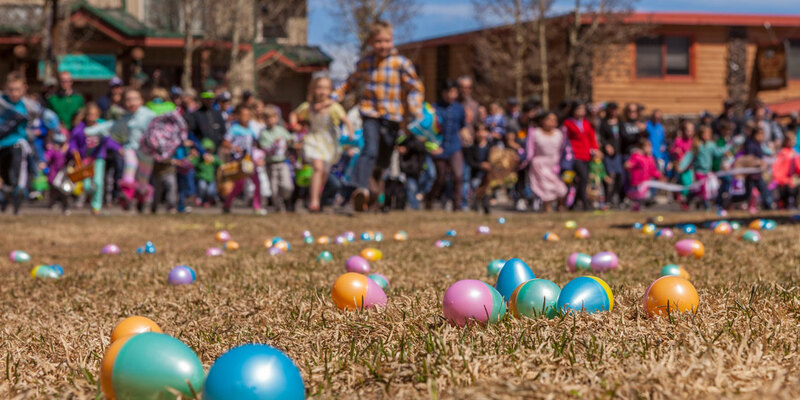 Frisco will hold its own Easter Egg Hunt on Main Street, hiding over 5,000 candy-filled eggs throughout the historic streets. Grab some brunch before lining up at 12 pm - fun for all ages! After the hunt, head over to Ready, Paint, Fire! Both Breckenridge and Keystone locations will be offering Easter-themed ceramics to choose from and half-price studio fees. Advanced booking recommended. Arapahoe Basin will also host its own egg hunt for skiers and non-skiers alike. If you’re lucky, you might even catch the actual ski bunny on the hill! On the hunt for real eggs? Choose the Blue Moon Bakery, Butterhorn Bakery & Cafe (highly recommend the Eggy Bread), or the Blue River Bistro (reservations recommended) to satisfy your hunt for eggs. All have exceptional brunch menus but fill up quickly - call ahead or get there early. Spend Easter enjoying egg hunts and spring skiing like nowhere else! River Ridge Rentals’ luxurious accommodations are conveniently located throughout Summit County and have something to offer everyone. Book today! Photo credit to Town of Frisco.